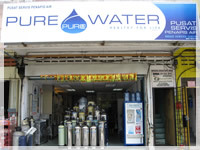 Pure Water House Sdn. Bhd. is a distributor of home, office and retail bottled water products across Kuala Terengganu, Malaysia under several brand names. The principal activity of the company is doing marketing and servicing of all water filtration products and water dispenser products . The human body is consist from 55% to 78% water depending on body size. A rule of thumb, 2/3 of body is consists of water, and it is the main component of human body. Jalan Hiliran 21000 Kuala Terengganu, Terengganu.